Some of the many reasons why I love LA: the diversity, and there's always something fun to do in the city, no matter what you're into. Since two of my favorite things are food and culture, Food-Culture festivals are the greatest pairing ever for me, and there are many fantastic ones each year from Brazil to Japanese American to Thai to Greek and many more. Coming up soon, is Taste of Italy. 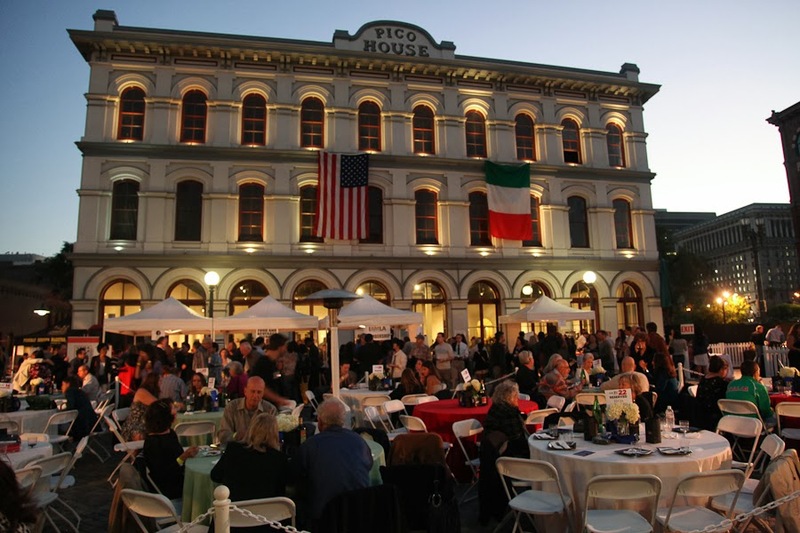 What:One day only food focused cultural event presented by the Italian American Museum, featuring 50+ restaurants, wineries, live entertainment and special guests. Anticipated drool-factor? : 100% - there's something for everyone from food for foodies from places like Drago Centro, DiStefano Cheese (yes they are the suppliers of that amazing burrata at Stella Barra!! ), Cafe Firenze, and Bulgarini Gelato, to cooking demo and book signing by Top Chef Fabio Viviani and non-food celebrities like Richard Grieco. Also, you'd be supporting efforts to educate and promote diversity and culture in LA as the proceeds benefit the Italian American Museum of LA (contributions are tax deductible "as permitted")! A friend of mine who loves and travels to Italy almost yearly highly recommends this event, so I can't wait to check it out! Feelin' lucky? You can give your shot at winning tickets to the event in their Sing for the Taste contest - just create a song with original lyrics about Taste of Italy or SoCal Italian American history, and shoot a short video of yourself singing it for a chance to win. Grand prize features 4 tickets to the event and $250 in Uber credits plus a basket of goodies. With Food & Wine and Lexus as presenting sponsors, Los Angeles Food and Wine has become that iconic, magnetic food event known attracting luminaries from the culinary world from around the country, to a four day spectacle for the senses taking place all over the city. Positioned as 'cuisine meets culture' - going to LAFW for foodies is sort of what I would imagine SXSW is like for music fans - but with chefs as the rock stars, and no stage to separate you. I was counting down the days to the event, having received a media pass to a few events including the Lexus Grand Tasting which would be attended by THE Grant Achatz, visiting from Chicago! 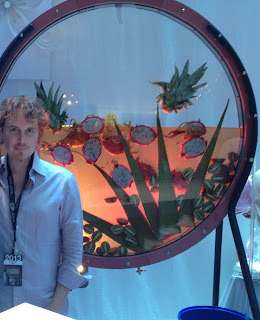 So of course the first order of business when I arrived to the Sunday tasting was to make a beeline for the Lexus Lounge, where Chef Achatz was stationed for the event! LOVED that he was very low key and graciously available to anyone who wanted to come up and chat or (dork out and) ask to take pictures with him. I was like a 12 year old girl accidentally let backstage at her first concert. Alinea and Next have been on my bucket list to experience...hoping I will be able to break away on an upcoming work trip to Chicago. Especially since chef shared that the theme for Next at that time will be Bocuse D'Or!!! Though like many others, I had been hoping to sample a bite of Chef Achatz' food, it was totally understandable that quality control and the experiential approach would not work very well in the AYCE, roving masses setup of a food festival. The Alinea/Next team served up a cocktail made with a chunk of pineapple that had been grilled - to add smokiness to the drink, while also bringing out the sweetness of the fruit - and frozen to cool the drink down without diluting it. Having accomplished my biggest mission for the event, I was then free to move on to maximize on the AYCE AYCD aspects of the event. Delta, as with previously years, handed out free lanyards that have a plastic wine glass gripper at the end - so that you can dangle your beverage from your neck, leaving your hands free to scavenge / double fist awesome bites of food on offer at tables spread throughout the event space. Too awesome for words. Here's a recap of some of the bites I had: Cliff's Edge: crispy pork, watermelon, toasted rice, barrel-aged fish sauce, lime & herbs. Beautiful colors on the plate. One of the things I love about LAFW grand tastings is the chance to try food from visiting chefs. One visiting one was Hearty Restaurant from Chicago - they put together a gorgeous display of perfect, in-season peaches! The sample portions were generous and delicious: grilled peach with herb-encrusted goat cheese, marcona almonds salad. Another visiting chef, Michael Ginor from Hudson Valley Foie Gras & Lola (New York) brought a flavor rich, perfectly toasted duck rillettes and peach chutney grilled sandwich with fried lotus root chips. I was hoping some foie gras would 'accidentally' be included in the sandwich, but no such luck...nonetheless, a delicious offering! Circa (Manhattan Beach) brought halibut ceviche with tiradito sauce, avocado and jicama. Cafe Pinot served up poached albacore, forbidden rice with yuzu kosho and black garlic. Really loved the combination! I'd read a bit about Pedaler's Fork in Calabasas, a hybrid bike shop / restaurant / cafe - and was curious to try their food. They brought a beautifully plated tower made of compressed yellow watermelon, heirloom tomato, burrata and speck. Verdict: tasty. Sierra Mar at Post Ranch wins my vote for most inventive & on theme display - hawaiian shave ice in gourmet flavors like strawberry chamomile were served in cones buried in brown sugar 'sand' along with dried starfish and decorative plants. From Mar'sel (at Terranea Resort): olive oil poached albacore crostini with crushed olives, pickled onion, preserved lemon & avocado. Holstein's Shakes and Buns (Las Vegas) sent out "Cuban" street tacos with roasted pork shoulder, smoked ham, swiss cheese, mustard aioli and pickle. AND a brilliant Red Velvet Shake made with red velvet vodka, cream cheese mousse, red velvet cake and mini whoppee pie that was perfect in the stifling late August heat. Littlefork unexpectedly brought meat versus seafood, perhaps to show range? Maple glazed pork belly, Johnny Cake polenta. As a big fan of polenta, I think I'd go back to Littlefork for more of this one. Littlefork also served 'corn off the cob' with Montreal Steak butter and parmesan. But if I had to pick a 'best in show' - it would be Picca / Mo-chica's Wagyu Beef Tartare Crostini with Truffle Shavings, Truffle Pearls, Parmesan Sauce. Visually, texturally and flavor-wise: perfect. Now I know based on my recap it seems like there was just a lot of food, but there were actually dozens of wine vendors pouring as much as you can handle as well. I'm just not much of a wine drinker - but I do love my sparkling wine / champagne and made sure to stop by for Perrier Jouet. Cocktails are definitely more my speed, especially creative ones. Steve Livigni and Pablo Moix were at the Old Lightning table personally mixing up amazing cocktails for us. Between the entertainment of bar masters shaking things up live, and the lovely looking drinks at the table, Old Lightning drew quite a crowd. So it was hard to catch what exactly was in the drink - but I thought I heard four kinds of rum, orgeat and coconut - topped by a tropic-thoughts-inducing orchid. In two words: liquid vacation. Magic. Can't wait to see what LAFW puts on the table(s) next year! "I eat faster than I write" has been my default mea culpa of late, usually accompanied by a helpless shrug. So it is that I'm writing about a visit to Daw Yee Myanmar Café - back in June - now in September. Better late than never? The only time I'd ever tried Burmese food before this, was at Burma Superstar in San Francisco - but that was pre-blog, no Instagram, no post, so it didn't really happen, right? In a less frequented part of Monterey Park, I'd expected Daw Yee to be a no frills hole in the wall - like many other restaurants that wear it's 'no decor' approach as a badge of honor vouching for its credibility and authenticity. The space was indeed tiny, but obvious care had been taken to balance a modern, clean and cozy environment with nods to Burmese culture in the form of ornate, towering urns. The kind of space I love, as you see the pride the owners take in the space - minus the pretentiousness or pandering too often exhibited in higher concept western translations of ethnic food. We started off, of course, with the signature Burmese dish: Tea Leaf Salad ($6.95) - the presentation on this one was beautiful, with it's collage of vibrant colors and varying textures. It's made with Myanmar imported fermented tea leaves, tomatoes, roasted nuts, and fried garlic. I have to say I loved this version much more than Lukshon's (knowing of course that the two are of completely different approaches) - it seems counterintuitive, but Daw Yee's version just seemed more...sophisticated...in its layering of textures and flavors. Then there was the Myanmar Tofu ($5.50 for 6pcs) - a super simple but incredibly delicious dish of fresh tofu freshly made with chickpeas, and fried in the lightest of slabs to a golden brown crisp on the outside, and silky smooth inside. One that I didn't anticipate loving as much as I did was the Rice Salad ($5.95) made with jasmine rice in spicy tamarind sauce with fish cake. It's kind of like cold fried rice, tinged with sweetness and hint of heat. With a party of 5, I tried to grab as much as I could as subtly as I could without seeming like a manner-less hog - but really wanted to take the whole plate and shovel it into my mouth with chopsticks while I prop my legs up on the nearest chair for balance. Nope, no decorum, at all. Another signature Burmese / Daw Yee specialty is Kima Platha ($5.95) handmade pancakes stuffed with masala seasoned beef (you have the option of choosing chicken). We couldn't scarf these fragrant little pancakes down fast enough! Somebody else (clearly :P) ordered the Vegetables Sampler ($5.95) with cucumber, okra, cabbage, fresh mango, seasonal vegetables served with Balachaung (Burmese dried shrimp relish). LOVED the relish - with the garlic, shallots, shrimp paste and chilies, it was an addictive party-for-your-tastebuds blast of bold flavors. The veggies just served as canvas for the flavor-colorful dip. You can't say you've had Burmese food until you've tried their national dish: Mohinga ($5.95) - rice noodles in catfish chowder. Knowledgeable friends advised that Daw Yee's is not the best rendition of mohinga, but it's tasty nonetheless and since we were already there and two of us had never had Mohinga, we had to try it. It was more of a soup than chowder, and delicious, but I think I kind of expected higher intensity - given the flavor-forward approach of the other dishes we'd had so far. We also tried the Fish Cake Curry ($6.95) which the menu describes as made with fishcakes, tomatoes and cilantro. It was creamy, coconut-y, and more chowder-like than the mohinga, and drizzled with chili oil. I liked this one more than the mohinga, actually. ...actually opens up to reveal storage for toothpicks and pepper packets! I found it amusing that such an ornate piece (albeit plastic) hid a treasure trove of such 'street' fare - to me that was an indication of a sense of humor about it all, that I loved. Aside from the restaurant, Daw Yee also has a few shelves of Burmese groceries along one wall for those interested in 'souvenir snacks' or buying some of the spices or tea leaves to try your hand at recreating the cuisine at home. All in all, a fun way to experience a small taste of the culture without travelling all the way across the world (just a half hour or so drive from mid-city LA!). And super affordable as well - with every dish we tried under $10! 'Real' ice cream lovers in Burbank rejoice: John Park, most recently pastry chef at Lukshon and Father's Office (who has also worked at 2 Michelin-starred Providence and Water Grill) has just opened his own place in a neighborhood known mostly for corporate chain food or 'suburban quality' mom and pops, and absolutely starved for talent of his caliber. A neighborhood shoppe on a quiet stretch of Magnolia between chain-riddled downtown Burbank, and the hustle and bustle of expansive studio lots, Quenelle's arrival draws foodies forward like a long awaited rain shower in the desert. First off, they have ice cream flavors that you would have never dreamed of being able to get in the depths of suburbia - from Orange Blossom Water to Caramelized Pineapple to Thai Iced Tea. I had been drooling for weeks over the R&D photos Chef Park had been posting on his Instagram (quenellespoon) and couldn't wait to try absolutely everything. On my first visit, I went straight for the Soursop ice cream ($3.50 small $5.50 large), a fruit that as the friendly cashier said resembles Cherimoya in taste (it is afterall from the same genus). Delicate in flavor but perfectly creamy in texture, I was in love at first bite. My second scoop was Blood Orange, a bright flavor that strikes a perfect balance in sugar/acidity and texture and brings the sunshine and depth of the fruit into each spoonful. Chef Park also brings his pastry chef talents to unique toppings (more on that in a bit) and delicious cookies, (bacon-cheddar!!!) scones and other pastry treats. I wanted to bring truckloads of their ice cream / baked goods home with me that first day, but as I had dangled Quenelle as incentive / worthy goal for myself to actually exercise (I biked multiple miles to get there...the payoff was worth it) I couldn't carry any of it back with me and had to wait til I could be back by car. And Quenelle also offers gourmet pops: I enjoyed the Hibiscus Watermelon (need to try girl scout cookie inspired Thin Mint next!!). But the push-pops, I had to have. Sadly, they had already sold out of the Mango Lemongrass push-pops that had me salivating via Instagram. When I heard that they only make about 20 push-pops a day, which sell out pretty quickly - I made sure to return first thing the next morning, a difficult thing for a decidedly non-morning person, but I set 3 alarms and it was worth it. They didn't have the Mango Lemongrass, but the flavor of the day was White Peach and Cream ($5) and it brought all the fun of childhood with taste and quality for the developed adult palate. Quenelle has easily already won me over to become one of my favorite places in the SFV. And because it's bike-able distance for me, I know it's actually going to help me stay in shape - because I am definitely going to be back - many, many times. Note that it doesn't really have any seating yet - there is only a kid's table with a single kid sized chair - so if you're visiting with a group it might be advisable to drive so that you can enjoy your treats sitting in your car...(or bring a cooler / insulated bag with ice for travel). If you are in the Valley (and if you're not) - drive, bike, walk - hurry over and check it out before it gets crowded!! Update November 2013: Ok, after many, many visits, my favorite treats are: thin mint pop (tastes like a much, much refined cold and creamy version of the Girl Scout cookie fav, encased in chocolate shell), peanut butter and jelly pop (the shell is peanut butter - and you can taste the peanuts as if they were fresh ground...jelly swirled inside ice cream in pop), blueberry pie ice cream, mango lemongrass push-pop (the mango in here is super fresh, and the push pop is so fun to eat! ), caramelized pineapple ice cream. Toppings? Caramelized rice and chocolate coconut feuilletine are amazing, every time.